Home » Website Building » WordPress » How to Change Default Media Upload Folder in WordPress? 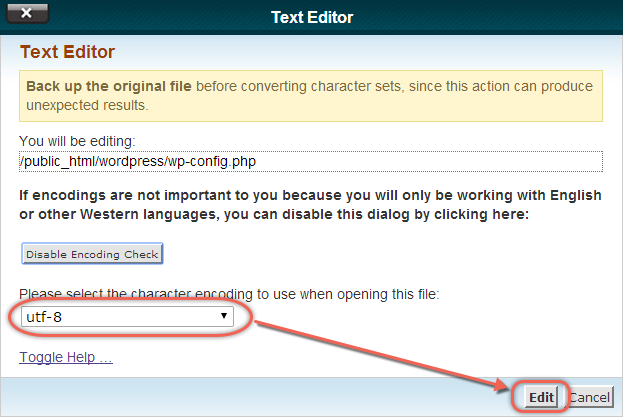 How to Change Default Media Upload Folder in WordPress? Only first two steps are needed for a new WordPress site and all other steps are needed for an existing site already having media files. Assuming you want to store all your media files under the directory called “media” then you need to first create a folder name in your root WordPress installation with a name “media”. You can create a folder either using FTP or using “File Manager” option accessible within cPanel of your hosting account. Here we explain the File Manager option available with Bluehost cPanel. Login to you hosting account and open “File Manager” option available under “Hosting > cPanel > File Management > File Manager”. Choose the root direct where your WordPress is installed. Choose “Web Root (public_html/www)” if you installed WordPress in your root directory or select the sub-directory from “Document Root for” drop-down if you installed WordPress on sub-domain or sub-directory of a main domain. 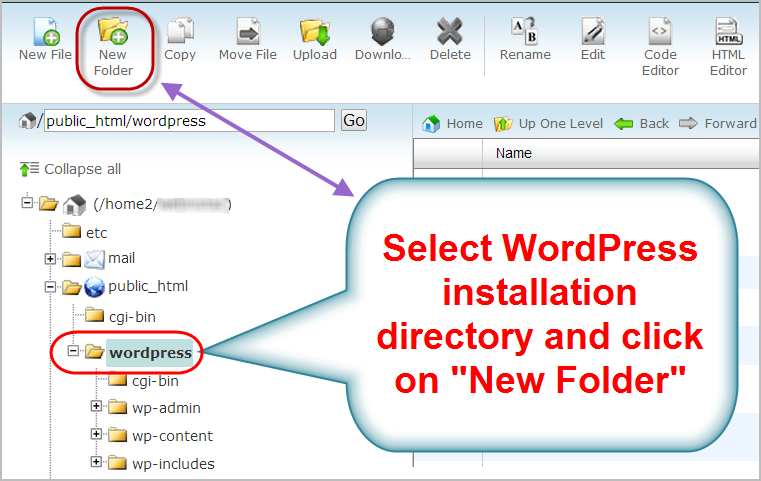 In this example WordPress is installed in a sub-domain “wordpress.webnots.com” so we create a new folder named “media” under the directory “wordpress”. Click on the “New Folder” icon as shown in the below picture. In the pop-up window enter the new folder name, check your root directory once and click on the “Create New Folder” button. 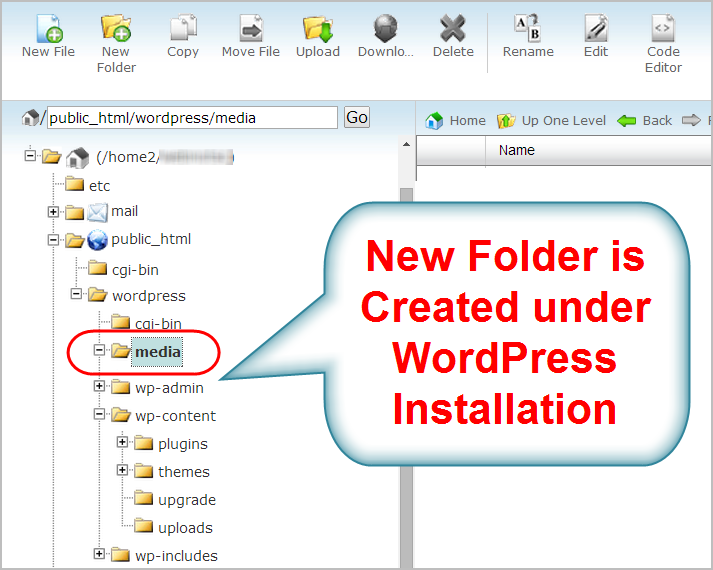 You can see the new folder with the name “media” is created under your WordPress installation. The next step is to modify “wp-config.php” file located under your WordPress installation root directory (normally “/public_html”). Click on the “Edit” icon in the “File Manager” as shown in the below picture. If prompted, choose “utf-8” encoding in the pop-up and click on “Edit” button (You will not see this pop-up if encoding is disabled). 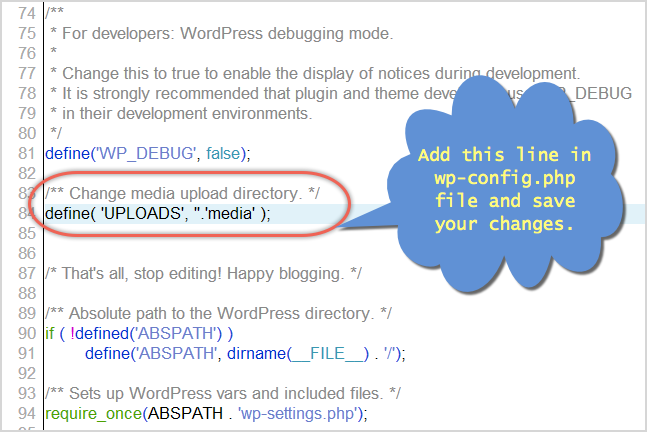 Add the following lines in “wp-config.php” file and save your changes. The first line is a comment line for future reference. Ensure to add correct single and double quotes in the code, copying the code from text editor like Microsoft Word will add different type of quotes in WordPress and makes the code not effective. 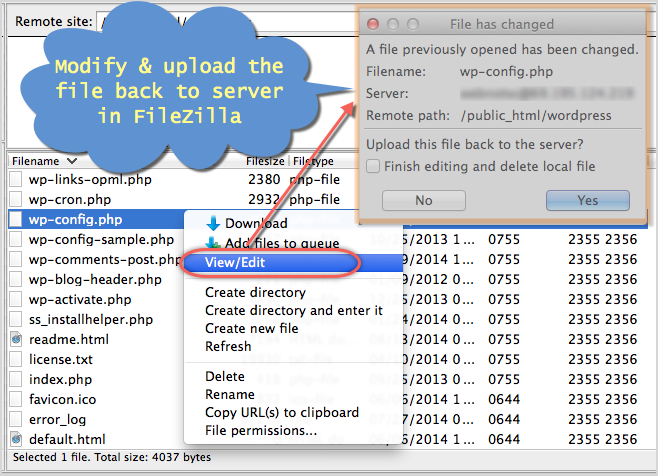 You can also use FTP softwares like FileZilla to modify and upload “wp-config.php” file back to server. 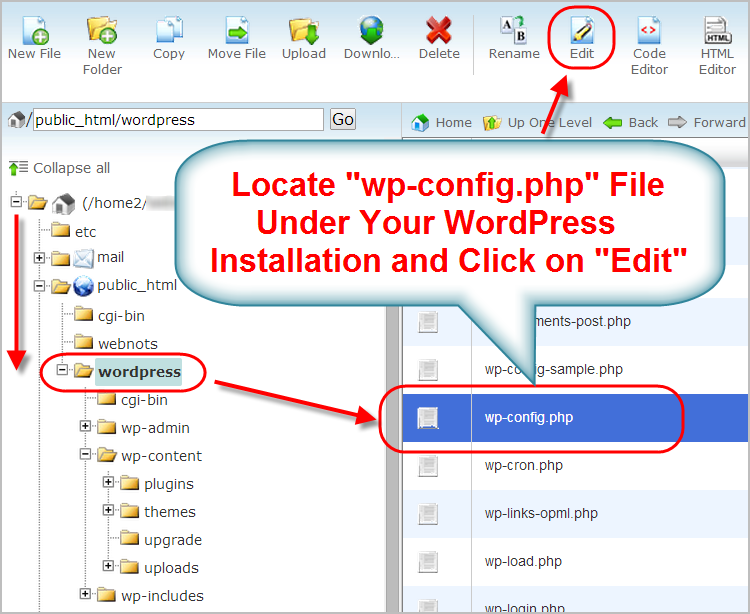 Once you changed “wp-config.php” file, all existing media attachments in your WordPress site will be automatically changed with the URL “http://www.yoursitename.cm/media/media-files” resulting in broken media links in all your posts and pages. You need to move all existing files to new “media” folder to adjust the broken links. You can do this either by FTP or inside your “File Manager” by just dragging and dropping all the media files from old directory to new directory. The final step is to check for any missed broken links of media files in your site. You can use plugins or external websites like brokenlinkcheck to find any broken links and correct them manually. 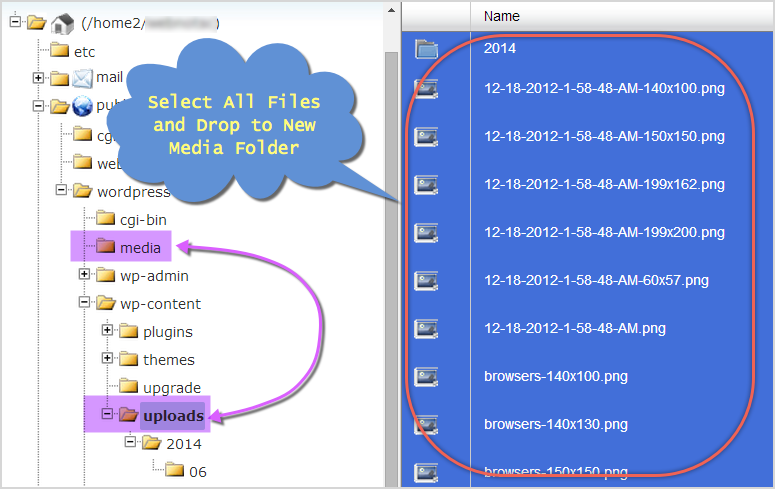 Any new media file uploaded in your site will be stored under the new “media” folder. Finally upload an image and check the file path that it is stored in new “media” folder created. If you see image not found or 403 error then the probable reason could be file permission settings of newly created folder. In order to check the file permissions, connect your FTP software to the server and navigate to the folder. Right click and select the option “File Permissions…”. 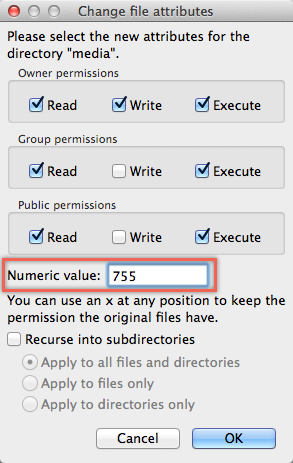 Ensure to select appropriate permission settings and the numeric value should be 755. Storing media files on external domain provides lot of flexibilities like independent backup, faster site loading in addition to added security. Whenever the webpage is loaded, browser will trigger separate HTTP request to server for every single image on the page putting lot of load on the server which adversely affects the page loading speed. By loading the images from external subdomain all images can be loaded in parallel thus increasing the page loading speed. Refer the step by step tutorial on hosting images on subdomain in WordPress. Try out one of these options and leave your comments if you face any problem. This is the fix recommended by all WP advice sites. Unfortunately, changing wp-config not only changes the default for uploaded media, but also changes the default used by some themes and page builders (e.g. Elementor). IMO, making this change is a bit risky. That’s the intended purpose of changing the media folder similar to storing all static files in Uploads folder. Otherwise, you will get lost if some files are in media folder and some are in uploads folder. That’s also the reason plugin developers refer the upload file path from configuration settings. If you want your plugin to follow the uploads folder then change the settings only within the plugin leave the global settings as it is. Is it possible to change un-select “Organize my uploads into month- and year-based folders” on a LIVE site? Are the current images and pdf files path changing too? Old media files uploaded will not be changed, only the new files will have different URLs. Thanks for the easy to understand tutorial, it works perfectly for me. Thanks for the detailed article, it was really useful to change the media folder. I am working on a Duplicator plugin copy of my sites to change things up without touching the live ones. Good thing or my live site would go down. Though I’m not sure why working on a copy would be any different … Could this be the reason? In other words, instead of working on nameofsite.com, I’m working on test.nameofsite.com On this particular site, I’m using a WP version back a few, albeit don’t think that would matter. Thanks in advance and Merry Christmas to you & yours! Please disregard. I figured out that I needed to add your code to a different place within the config file. Namely beneath the require_once(ABSPATH…. bit. Now it works perfectly! Thanks! Perhaps it’s a plugin or my theme that causes me to place it differently? Anyway it works so no worries 🙂 Thanks again! My site no longer loads and I get the following error after trying to set this up? Could you advise me on what I did wrong? Your instructions were very succinct so I’m surprised by the outcome I’m getting? Check the quotes you used in the code. As already highlighted in the article, if you copy from text editor the single / double quotes will be in different format which will not be parsed and show error. First of all thank you for getting back to me! I actually figured out the problem steming from the double quote vs two single quotes. That being said in the WP Dashboard, whenever I select <> WP still attempts to look for the folder in it’s previous location? I haven’t been able to figure out why it will not look in it’s new location (running WP 4.0). I really wanted my media files outside for wp-content folder…If you have any recommendations I would appreciate it! Are you referring the URL (…/wp-admin/upload.php) in browser’s address bar when you click on “Media” inside WordPress admin dashboard? If yes, it is a “Media Library administration panel” file stored under your “wp-admin” folder as “upload.php” which will not affect where your files should be stored. To check file path, upload a new file and check the “File URL” which should show the new folder. Or if you have any existing images on your site, right click and copy image URL, which should show that the image is stored under the new “media” folder you created. Thanks for this info, i as a beginner was also looking that URL. Now that i checked and everything is working fine.